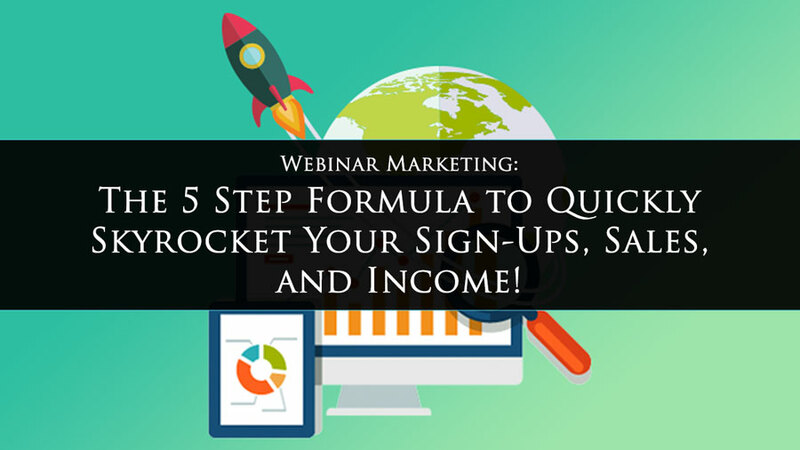 WEBINAR MARKETING:The 5 Step Formula to Quickly Skyrocket Your Sign-Ups, Sales, and Income! Webinars are in fact the highest-converting sales strategy online. They’re more effective at closing prospects & customers than sales videos, sales letters, or any other online closing strategy available to us today. We've used webinars at MLSP since our inception and have since built a multi-million dollar business on the back of webinar marketing. It just flat out works, and we're proof. For those reasons, we’re going to show you exactly how to create a webinar, and teach you the webinar best practices of a six-figure webinar marketer today! 3 Reasons You Should Start Using Webinar Marketing As Soon As Possible! How to Create a Webinar That Converts Like Crazy! CHAPTER 13 Reasons You Should Start Using Webinar Marketing As Soon As Possible! #1: Scheduled Events Get More Attention and Trigger Commitment! Psychologically, a scheduled event gets more attention than a non-scheduled event. You can see the difference right in your own life. For instance, consider the difference in a party that you get invited, to and RSVP for, over a simple verbal commitment you make to hang out with friends one night. Which are you more likely to attend? Almost every time the scheduled party with the invite and commitment will get you there come hell or high water. The non-committal plan on the other hand will get you there...as long as nothing better comes along. It works the same way online with webinar events. You get invited, you commit, and you’re invested. You arrive on time, phone turned off, and you stay totally focused throughout the event. Why? Because you made a commitment to it! Walk into ANY classroom in the world, and right away you know who is the authority in the room. The teacher at the front. When you become the trainer on a webinar, you automatically create authority. On a webinar, you are that person in the front of the virtual classroom. You therefore become the trusted authority and an authority on the topic you’re teaching! People only join or buy from those who create know, like, and trust. That’s precisely what a webinar establishes… and does so very quickly. #3: Webinars Cause Your Income to Spike! When done right, a webinar can cause a dramatic spike in your income. The fact is that when you’ve got an attentive audience, with a presentation that gets and keeps interest, gives value, builds desire, and asks for the sale...you can get a number of people all buying at once! If you are in network marketing for example, this means you can easily sponsor 12-18 reps into ANY opportunity each month, or earn $2,000-$4,000 in commissions every time you do a simple 60-90 minute presentation. This can skyrocket your level of success in network marketing. You can create a full-time income rapidly with effective webinar marketing. Click here to learn how to earn an extra $2,000-$4,000+ per month in YOUR business with webinars even if you're just getting started. One of the biggest setbacks you’ll face when it comes to learning how to create a webinar is fear! This is when it’s time to make a decision. Which will dominate? A fear of what others think... or your dream for freedom for YOU and your family? The great thing is that it’s not as difficult as you think getting through this fear. In fact you can usually overcome it with one single Webinar! 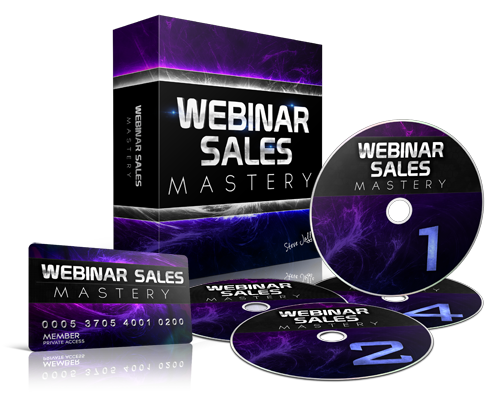 #1: Have a Proven Webinar System to Follow! It’s an often overlooked factor, but great training with a proven system can do wonders for your confidence level. It takes away the mystique of forging ahead alone when you’ve got the knowledge of someone that’s come before you. The right training will turn your fear into confidence! 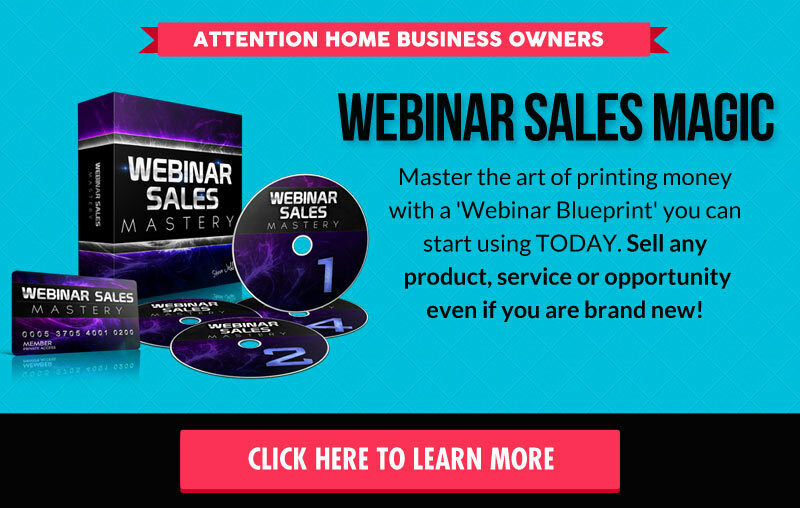 SPECIAL OFFER - If you truly want to master the art of printing money with webinars, come get a 'Webinar Blueprint' you can start using TODAY to sell ANY product or promote ANY service & opportunity... even if you are brand new and never made any money before! One of the cool things about webinars is that you can do a practice run without an audience. In fact you can do a couple. Do one alone, and then do another with a friend watching. You can record your presentation, watch it, and then work out the kinks. #3: Tap Into Support from Fellow Marketers! There’s nothing like getting support from others. Especially others who have been or are in the same boat as you! . It can light a fire inside of you, and make you see that you can do things that you didn’t previously think you could do . MLSP has an extremely supportive community that does exactly that for members every single week to create tons of success inside our community! #4: BONUS! Just Do It! Nothing beats fear faster than just facing it! When you face your fears, you realize that your fears were often not as warranted as they seemed. COMPANION VIDEOWatch the Video Below to Find Out How to Get Past Your Webinar Phobia! Your promotion strategy is the key, and luckily you don’t have to reinvent the wheel to get started. Webinar expert Steve Jaffe has already hashed all that out for you. 2 Surefire Tips to Get a Flood of People to Register for Your Webinar! 1) Create a Title with a Unique Selling Proposition! You’ve got to make your webinar stand out from the crowd. That’s where your title comes in. Your title must let your target market know without doubt that your webinar will give them exactly what they’re looking for! Let’s say you’ve got a webinar on Facebook Advertising. Most people would use something like “Facebook Advertising Secrets”. Pretty boring. 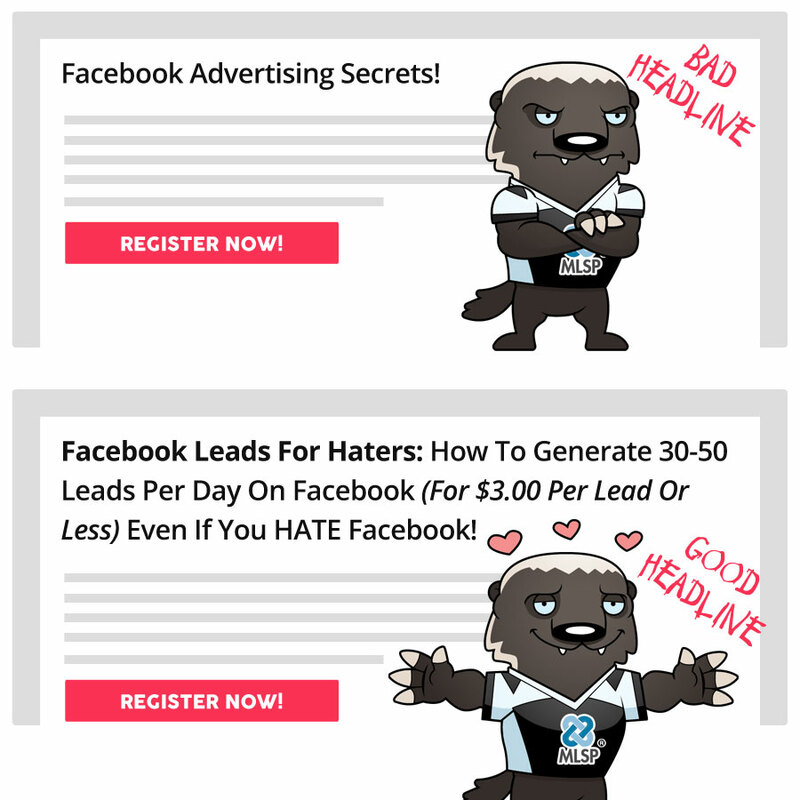 That’s not going to bring in a flood of registrations, because it simply sounds like every other webinar or training on FB advertising out there. Plus it doesn’t really tell them WHY they need these secrets. It’s pretty easy to see which would pull more registrations -- and very likely sales! No kidding right? But here’s what we mean. Through testing, higher conversions come from shorter, punchier, benefit laden registration pages. Your Headline - This is your USP we spoke about above. Registration Button - A highly visible button, with a call to action, that’s above the fold if possible. COMPANION VIDEOThis Video Explains How to Get Tons of People to Registered for Your Webinar! Registrations are great, but what really matters is how many people attend your webinars. There will be an amount of people that register and don’t show up. But don’t worry. Your job is to simply maximize the number of people that show up! Follow the tips below to make sure you MAXIMIZE your attendance rate and get people showing up to YOUR webinar! #1: Create Scarcity and Urgency! Set a max limit for attendance. This will create a sense of scarcity, and therefore urgency for people to attend. Basically you want to create the fear of getting locked out of your webinar. You can take it a step further, by sending an email to those that registered. As you go past your capacity, you can send a screenshot and let them know there's a real chance of getting locked out if they’re not on early! On your registration confirmation page, you can remind them WHY they need to be there (your USP) and let them know that there's a bonus gift that will help them take their business even further. Of course they only get the bonus if they're on the webinar! This will increase your attendance rates beyond the norm of the industry and give you a huge advantage for sales and sign-ups! Steve Jaffe often gets 60%+ attendance to his webinars. Which is an unheard of number! NOTE: This is a very aggressive approach to promoting a webinar. You audience may be different. Use this as a baseline and guage your audience reaction - track your attendance rate and see if more or less emails are necessary to max your attendance. COMPANION VIDEOSteve Jaffe Explains How He Gets Up to 60% or More Attendance Rate for His Webinars! Following this blueprint will take your audience on a journey and ultimately ends in lay-down sales and your attendees TAKING ACTION! Otherwise, what's all this been for? 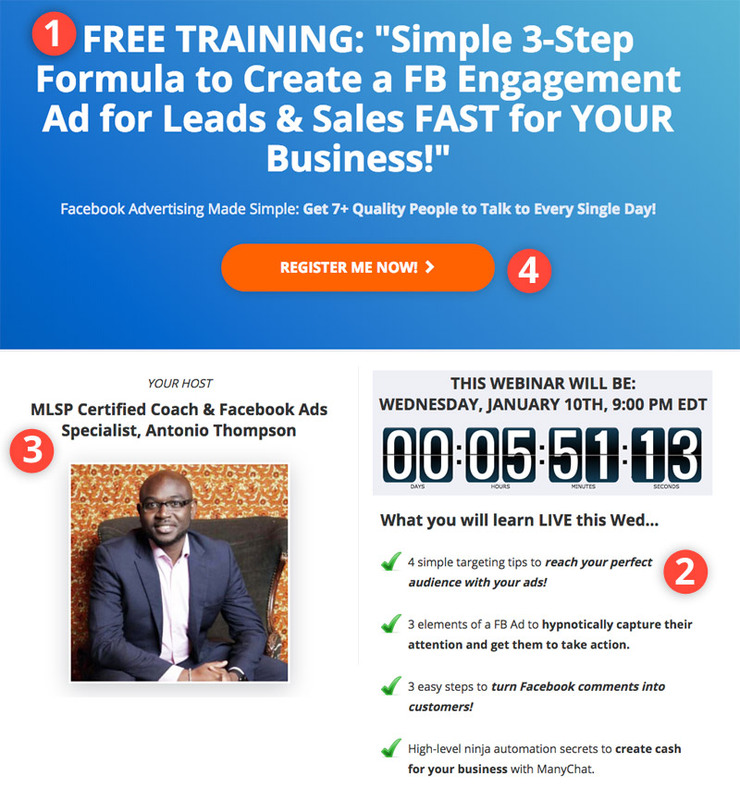 Take a look at MLSP's ultimate webinar script that we've used over the last 10 years to generate almost $50 MILLION in sales! 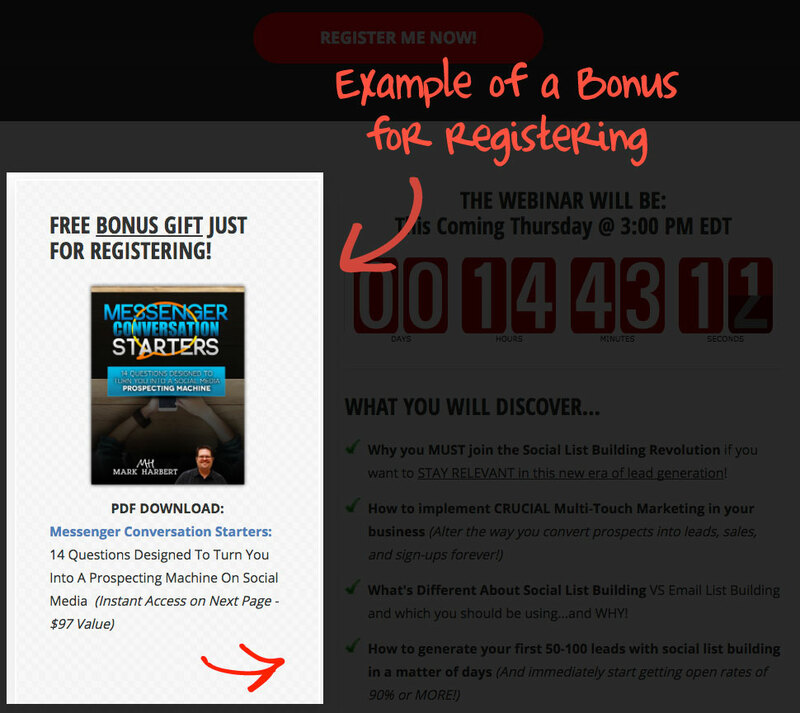 Below is the 3 part structure that will have your webinar converting like crazy. 1) Your Intro Must Get Attention! Tell Your STORY to Build Interest & Desire! Nothing grabs and holds attention better than the power of story. This story will add to why they should keep listening, because you're going to show them what's possible for THEM if they keep watching. Every story has a beginning, a middle, and an end. The End: This is where they'll see the results that happened to you, and realize what’s possible for them! It's important that your attendees feel like YOU are one of them. That you were exactly where they are now, until you made the discovery that was the remedy to your struggles. This is where you create the KNOW factor! 2) Do Your Training Presentation! This is where you'll give them value and earn their TRUST! Give them a 15 to 35 minute training. Of course you won't give away the farm here. But you will give enough so that they can get a result of some sort, whether they go on to purchase the product that you'll promote at the end or not! You'll want to signify that it takes time, effort, and energy. That they’ll have to work. However there's a system/course/strategy that will let them get the same type of results that you’ve achieved, WITHOUT all the pitfalls that you had to go through. 3) The Close to Create Action! Warning: ONLY promote things that you have used, are using, and feel good about selling. Don’t promote something just because you’ll get a big fat commission. Getting people to attend your webinar is one thing, but using proven sales closing techniques to actually close sales on a 'one-to-many' level is what makes webinars so powerful. Describe What They’ll Get: Give them the features of your product, and try to answer any rebuttals that they might have within the presentation. Establish Value of Your Product! Compare competing offers that cost more, yet don’t have as many features, or both. Add Bonuses! Make your bonus compliment the product you’re promoting. Yet so valuable as a stand-alone product that some people buy just for the bonuses. Finish Up with a strong call-to-action to BUY NOW! COMPANION VIDEOWatch the Video Below to Find Out How to Convert Sales On Your Webinars! The truth is webinar marketing is a skill that most people will never attempt. Therefore this strategy will give you a huge advantage. But when you know how to create a webinar that gets tons of registrations, maximizes attendance, and creates sales...you’ve got a winning formula that will leave your competition in the dust, and will skyrocket your earnings! ACKNOWLEDGEMENT: We want to acknowledge and honor our dear friend and webinar marketing phenom Steve Jaffe for providing the training above so that we could serve YOU, our beloved audience. MLSP L4 leader Steve Jaffe has closed over $250,000 in cumulative sales on webinars, authored MLSP's webinar marketing course, taught webinar marketing as a featured speaker at 3 MLSP Live The Dream events, and taught webinar sales skills to thousands of students and many industry leaders. What did you think? What did you learn? Are you ready to add some Webinar Marketing to YOUR business & marketing plan? LET US KNOW IN THESE COMMENTS!